Whether you want to highlight your business environment with a dramatic water effect or bring the beauty of water into any indoor or outdoor landscape, a fountain is an elegant addition. Water effects are the perfect combination of artistic and architectural, encompassing fountains, weeping walls, streams, jets, and waterfalls. Truly, the design options are endless! Rest assured though, our water effects are designed to be memorable to visitors while being low maintenance to keep the investment value in the property. Beninati Pool's commercial water features team has efficiently and effectively completed numerous projects over the past 25 years. Our years of expertise, skill and accreditation permits us to work on everything from a simple repair to the largest of projects. We are a one stop solution for your aquatic project! We see our projects through the entire process of artist design, engineering, construction and maintenance. Our clients include: wedding chapels, parks, resorts, business parks, and recreational areas - just to name a few. 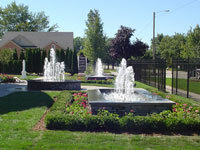 Beninati Pools has the reputation as one of the top custom water features company in Michigan. 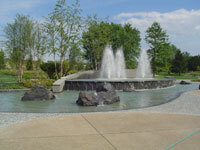 Our custom water features can provide a signature or finishing touch to any home. Nothing accents your home like the calming sounds and beauty of a fountain or the quiet enjoyment of a backyard pond or water garden.